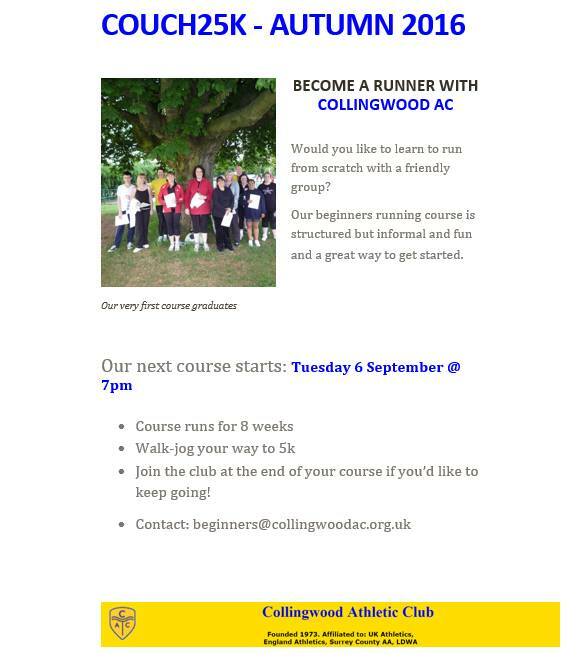 Welcome to the web site of Collingwood AC. Our aim is to welcome everyone who wants to run, irrespective of experience or ability. We run because we love running. We run in all weathers, on all surfaces and no-one runs alone. Debbie and Lisa represented Surrey at an Inter-Counties XC yesterday (08/12/18) at Oxford. Well done to the winner of the 36th Recurring Handicap (06/12/18) - Karen Harrower. Debbie and Lisa both first in their age categories at the Surrey Masters XC 20/10/18 and Debbie followed it up with a 2nd place and 1st in category the next day at the Croydon 10k. Track sessions - We're now at the David Weir Centre on Mon nights every week, 7:15 for a 7:30 start. Latest scoring in the 2018/19 Club Competitions is on the Competitions page now (09/09/18). Rebecca Griffin completed the BUPA 10k safely on Monday and raised £650 for the British Heart Foundation. Thanks to all for their support. Gill Griffin. A new M50 course record (42:51) for our men at the Nonsuch Relay 06/07/16. A fantastic 1-2-3 at the Tour of Epsom (9-13/06/14) with Roger, Gordon and Richard F taking the honours. A bronze medal for our M50 men at the Surrey County Road Relays at Wimbledon Park (03/09/16). Team prizes - a few weeks after the men took the team prize at the Tadworth 10, this weekend (26/01/14) they also took the team prize at The Perch. There were also individual awards for Neil Reissland (1st), Roger Bryant (1st M40) and Mary James (2nd). We sadly have to report the death of Andrew Griffin. It seems Andrew collapsed whilst out running yesterday (16/07/13). He was a valued member for the last 8 years, often representing the club, and a true gentleman. He will be missed. Our condolences go to his family, wife Gill and daughter Rebecca. Nonsuch Park Relay: new course record. Collingwood set a new MV40 course record (42:06) at the relay 03/07/13, beating the record we set last year. 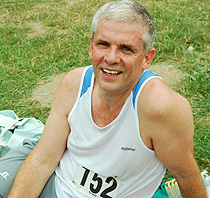 Well done to Andy Stalley who completed a milestone 100th marathon at The Picnic on Sat 20 Jun 09. Results and photos. For info on the Club Championships, Handicaps and Age-Graded competitions, go to the "Competitions" page from the link in the menu above. A nominated race list for 2018/19 can be found on this page. The club is growing all the time. We currently have around 100 members ranging from casual runners to the highly competitive. If you're a teeny bit interested, why not try before you buy - come along to our HQ on a training evening (Tue/Thur 6:45pm for a 7:00pm start) and check us out. Or you'll find us meeting for long runs on Sundays when we're not racing, on Stafford Rd., Wallington at Mellows Park car park (9:00am). Runners of all standards welcome - this means you. Club Championship 2017/18: this year's winners were Jenny Cooney and Ashley Pate. Handicap winners were Jenny Cooney and Ashley Pate. Age-graded winners were Shun-Lai Chan and Ashley Pate. Quiz night at Croygas: the next quiz is TBA, £2 per head, team of 6 (max). This site is for members and non-members alike. Hopefully you'll find some useful information within these pages whether you're with or without us. Although most of the results listed in the right hand pane are focussed on members' performances, there are many links to the full results of races as well. cheaper race entries - save �2 or more on road race entry fees when you're a member of an affiliated club. Entry to league and most of the championship cross-country events is even cheaper - we pay your entry fee!